In Homo Ludens: A Study of The Play Element of Culture, Huizinga argues that “civilization is rooted in noble play and that, if it is to unfold in full dignity and style, it cannot afford to neglect the play-element.” He discusses the play-element in human activities including: art, language, poetry, sport, law, and war. And he helpfully provides a thorough criteria for what constitutes real play. Play is “voluntary activity,” “disinterested activity,” “creates order, is order,” “has rules,” and so on. Etty Hillesum and Simone Weil can help our understanding of political science through their accounts of participatory experience of the full amplitude of reality. Their reflections on their everyday experiences attest to the truthfulness of Eric Voegelin’s political science. Specifically, they raise the question: Once we open ourselves to the “ultimate purpose toward which we are rationally oriented,” then what? How is human openness to transcendence made manifest in our daily living? Through the diaries and letters of Hillesum and Weil, we can understand the meaning of participation in living within those questions that one cannot ask without some change taking place in the soul of the questioner. Voegelin symbolized these experiences as the opening of the soul to transcendence. This involves the recognition that man is not the source of his existence, so he cannot be the ultimate measure of it. Such insights are not propositional or axiomatic, but are experienced through paradoxical and meditative participation in the turning of the soul toward truth. This is also the fundamental experience of a political theorist who can then begin to analyze society against the standard of divine truth rooted in the nature of the relationship man experiences in his response to God. My senior thesis was just posted on VoegelinView.com. 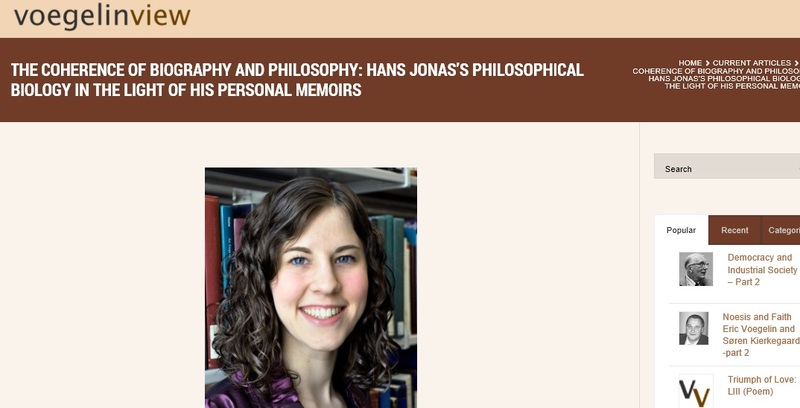 The topic is the relationship between a person’s biography and his or her philosophy. I studied this by reading a particular thinker’s memoirs and relating these to his philosophical writings to show the coherence between his experiences and his insights. Feel free to take a peek, here. Using abstract nouns like “society”, “community”, and “humanity” seems to disregard the important fact that, in reality, there isn’t some perfect consensus; individual persons are divided on every single political, economic, social, and moral question. Do you think there is a ‘media party’ with a consistent ideological bias because of the idea that there is (or can be) a homogenous, social consensus on things when no “shared story of collective humanity” actually exists? The speaker then argued that the neo-liberal view is mainly an economic one and that its adherents have the wrong anthropology. “What if the ‘neo-liberal’ anthropology is actually quite truthful and ‘Catholic’? I mused. He said, “Try to make the case sometime.” Then he noted Father Raymond de Souza as an example of a ‘right wing’ Catholic who gets published in The Register. Nice to have one token conservative. Given how relevant economics and politics is to our lives, shouldn’t we be able to discuss these controversial topics in the light of faith and from a plurality of perspectives? I think this is why Father Sirico founded the Acton Institute. And I’m thankful he did. Acton University is the first place I ever learned the term “philosophical anthropology.” Michael Matheson Miller told us that JPII had said, “The fundamental problem of socialism is anthropological in nature.” What he meant is that socialists give an incorrect account of the human person. I don’t think that all my fellow Catholics and, more broadly, fellow citizens should think like me. I do hope though that we would be able to think about things together without excommunication from the conversation on the basis of different political and economic perspectives. It’s the Creed that’s universal among a particular faith community. Is it not some form of idolatry then to elevate policy opinions (and, dare I add, social doctrine) to the status of dogma?